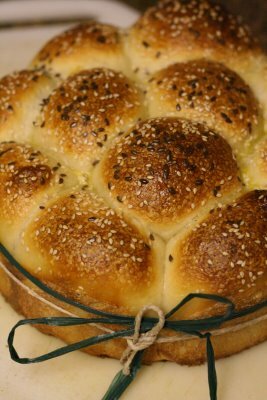 These rolls make a beautiful compliment to anyone's Thanksgiving table. If timed properly, these can be baked right when the turkey is about to come out of the oven to provide a wonderful accent to the meal. 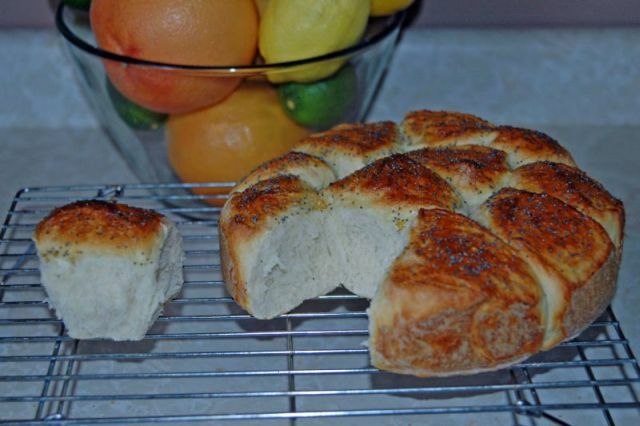 This recipe is inspired by the Buttermilk Cluster recipe in Country Breads of the World. I made a few minor modifications, such as including a little bit of honey, but in general it is the same thing. Combine the flour and salt in a large bowl. Combine the warm water and yeast in a small cup and allow to proof for 10 minutes. Pour the yeast, buttermilk, and honey into the flour mixture and mix well. If the dough is so dry that some of the flour won't stick, add a bit more buttermilk or water. If the dough is too sticky to knead, more like a batter, add more flour by the tablespoon until the correct consistency is achieved. Knead by machine or hand for approximately 10 minutes. 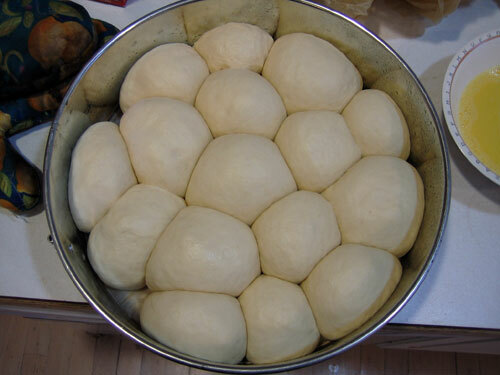 Return the dough to the bowl, cover the bowl with plastic wrap or a damp cloth, and set aside to rise until the dough has doubled in size, approximately 90 minutes. 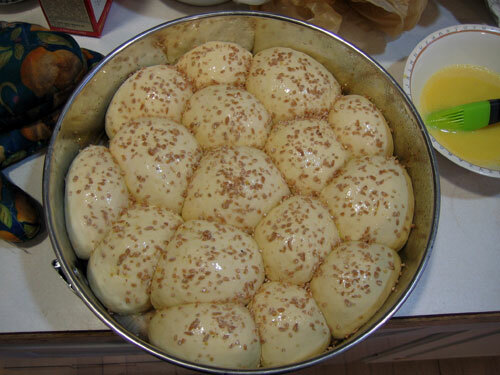 Divide the dough into 12 to 18 pieces. If you are a stickler you can scale them so that they are even, but I just cut them roughly the same size. Shape each piece into a neat ball and place in a round dish or spring-form pan close together. When all of the rolls are in the pan, cover again with plastic or a damp towel and set aside to rise again for 45 minutes to an hour. Meanwhile, preheat the oven to 425. Uncover the rolls and brush gently with the egg wash. Sprinkle on the grain topping, if you like. I used cracked wheat. 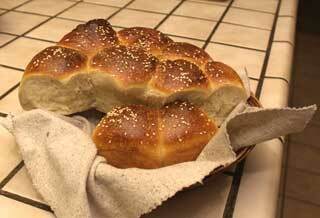 Bake for approximately 30 minutes, until the rolls are firm and spring back when tapped. Unmold the rolls from the pan and serve warm. That looks awesome. I'll have to try that. What size pan did you use? I used a 12 inch springform pan, I believe. 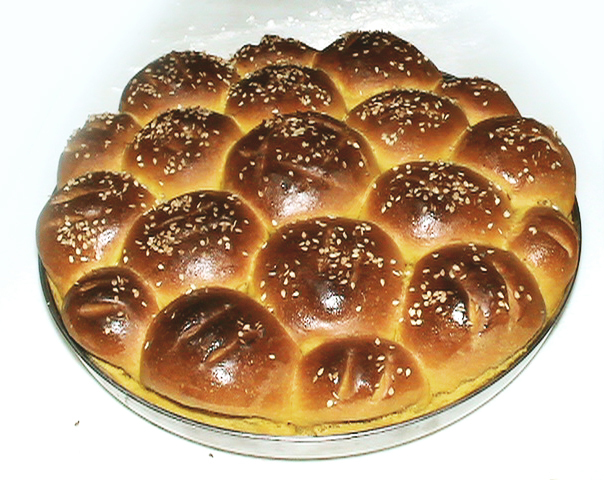 Remarkably similar to a traditional Ukranian sweet bread called stuffed with sweetened cottage cheese called boluchkie though it is not made with buttermilk but cream. Oooh, I love those (thought I don't think you're thinking of boolochki as they're typically not stuffed, at least not where I'm from). Do you have a recipe handy? Floydm--I baked this last weekend and it was fabulous. 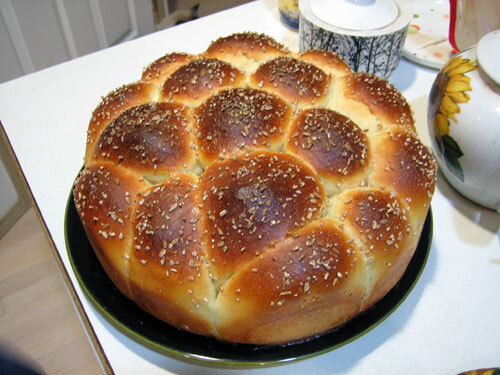 I topped the rolls with stell-cut Irish oats, and my family went nuts for them. I'm making them again today to have with soup for dinner tonight--thanks for the recipe and the great photos! Splendid! I'm glad to hear they came out well. As Rachel Ray would say... YUMM-O! Wow!!!! All the pics are wonderful!!! I'm gonna have to try this recipe. YUMM-O!!! These were the first recipe that I tried from this site in time for Canadian thanksgiving in October. Mine were very appreciated by the guests and looked wonderful. I also used buttermilk powder, which was a gift from someone coming to mexico from the states. Thank you Floyd for the great recipe. How many loaves would it make? 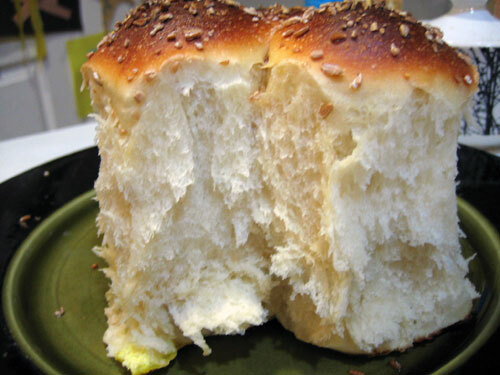 Butter bread: I love this butter bread. I think this is good for appetizer for almost everything. The crust is so delicious! 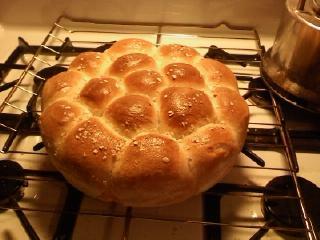 This is the second bread I bake and it turned out perfect! only your second bread? clearly you're a natural! I made this today. It came out really good. Only my fourth try working with dough, two of the other times were making pizza dough. Anyway, my dough was initially too dry, I added about 3 addtional ounces of water to be able to work the dough properly. 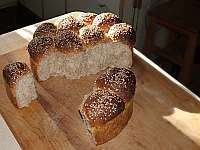 I was really happy with the bread, I topped it with sesame seads. I think it could have baked maybe 5 minutes or so more, the crust was perfect, but had a slightly yeasty/doughy tasting crumb. Although the texture seemed perfect. Maybe I'm not used to eating such fresh bread. But after it fully cooled, that yeasty taste went away. Am I correct in thinking it should have baked a little more? I should have stuck a thermometer in it, oh well, next time. This bread was pretty easy to make. Overnight retard ok for buttermilk cluster? I'd just your thoughts on an overnight retard of the buttermilk cluster. I was thinking maybe I could put the rolls in the fridge after the first rise and when it's formed. I'd like to be able to pull it out the next morning, let it warm up and rise and then bake. Do you think this would work? I've not tried it with this recipe, but it should work. Certainly worth a try. In the front seat of my Jeep (hee hee). We ran out of refrigerator room so we stored a few things in the Jeep (covered with plastic and then a beach towel, of course). It got down to about 17 degrees here last night so our cold garage makes a perfect second refrigerator when necessary. I just retrieved them. They rose nicely during the night. I'll warm them and bake them while the ham rests. (Yep, we're having ham - not too many turkey lovers around this family...). I'll let you know how they turn out. Just wanted to report back on my experiment in the overnight retarding of the buttermilk clusters. Given the fact that they sat in a very warm kitchen for about two hours longer than they should have before being baked and the fact that dinner was running late and we really didn't let them rest properly before serving - they were pretty darn good. Top and bottom crusts were a little chewy but the crumb was quite good (except in the middle which was slighly underdone.) Even with all that - every single one was eaten or taken home by family with other leftovers. 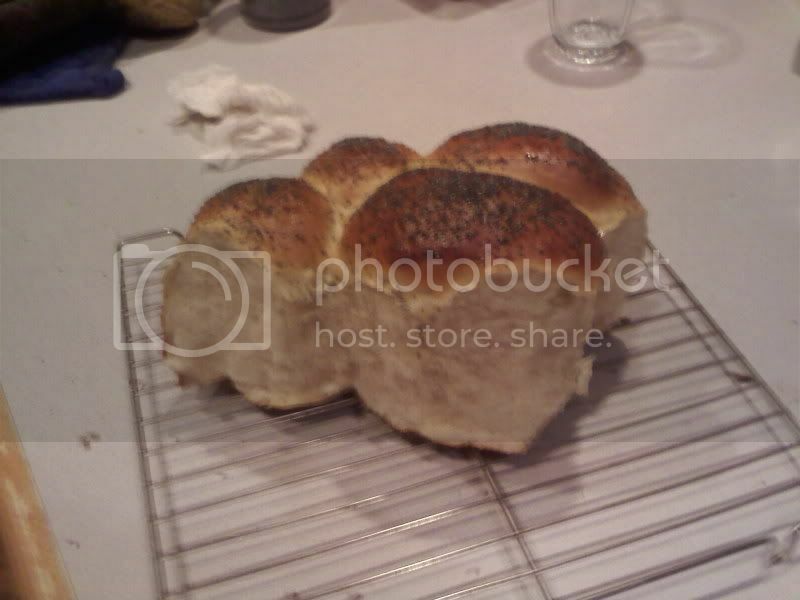 I will try this again when my timing is better - but I think these rolls can be easily overnighted in a cool place and still be great the next day. Stumbled upon the site while looking for help with a kneading bowl. Astounded by the assistance I've received and totally fascinated by everything! Haven't totally figured out how to move around, but I'll get there. These had great texture but were tough. Any basic reasons why bread gets tough? Is there a purpose for the glaze aside from keeping the toppings in place? I wiped the tops with soft butter when they came out of the oven, just like Mom used to do. Many of the recipes I've viewed use 425 temps. Had to come down to 350 (my norm) half way through the baking as the tops were on their way to deep brown. Why such high temps? What is the purpose of water in a pan in the oven? Know it wasn't mentioned in this recipe but for some reason, I remembered it and placed it in there. Did that contribute to the toughness? These rose to over 3 inches - beautiful, but way too much for use as a sandwich bun (hamburger or something). Any way to get 1 1/2 (approx) inch height or isn't this an appropriate recipe for such? Finally, how do I add pictures to my comments? Any help will be appreciated. By the way, I keep dry buttermilk on hand, so that was used. These were kneaded by hand and baked in a 9x13 cake pan. I also made fresh fig jam yesterday, so guess what my dessert consisted of? (I've got a wicked grin on my face right now.) Finding y'all is not going to be good for my waistline! Like others, I had to add quite a bit extra buttermilk, about 1/2 C. The dough was still very stiff - as stiff, or stiffer than bagel dough even - so I was worried that they would be too tough. But they rose beautifully (I shaped and let slow rise in the fridge overnight) and baked up perfectly. They had a nice, well browned crust on top and had a soft and perfect crumb. I topped them with a combo of flax and sesame seeds which I think looked nice. Thanks for the recipe. I'm fairly new to bread baking so this was a great recipe to find in time for the holidays. LOVE the raffia tie! Adorable presentation! Just baked, and ate this loaf! It was beautiful. I used the last bit of a bag of bread flour - a little less than 6 cups, and threw in a loose 1/2 cup of whole wheat flower, and a teaspoon of wheat germ for good measure. The added wheat gave it a rich flavor that I thought really added to the buttermilk taste. My audience seemed to agree! The bread was gone in about 20 minutes! Sorry for the poor quality pictures. My camera batteries are dead and I took these with my cell phone camera. My 1st bread by hand... no machine. It came out a little dense, but I'm sure it's because I'm a newbie and I also added 3 Tbsp of Vital Wheat Gluten. Tastes great though and I'm enjoying the buns with steak and salad tonight. i made your buttermilk cluster yesterday and it really turned out great.i made some minor modification like i use sugar instead of honey and i added 1 tbsp of margarine.i also dont have buttermilk at hand so i used low fat milk.I divide the dough into 24 pieces and i use 3 small loaf pan.but still it turned out great.thanks for the recipe its a keeper. I started it the night before since our kitchen is pretty busy on Thanksgiving day. I made up the rolls and let them rise for just a few minutes, then refrigerated them until the turkey came out of the oven. 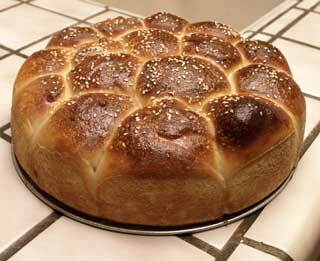 Then I put on the wash and some sesame seeds and baked the rolls. They were ready just as the rest of the meal went to the table. Thank you floydm for a wonderful recipe. These came out light and tasty, and baked up to a beautiful golden color. 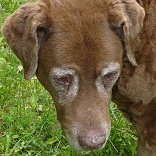 Here are a couple of pictures of the results. We had some left over since we were only three for dinner this year, but I may make these again at Christmas when the whole family will be together. adjustments, especially if you use bread flour. With AP you might need a few grams more, but I would not start out that way. I think you will be able to tell if you hand-knead a few strokes before bulk fermentation. Add a little flour if you have doubts at that point. I used the bread flour called for and followed the recipe as described, and I think I could have formed a free-form loaf with my dough as it was, without adjustments. Good luck, and come back to let us know how it turned out. Happy Thanksgiving! Made these for thanksgiving, they were very good!! The only real issue I had, was by adding the buttermilk straight from the refrigerator, made the dough very cool. It took a very long time to raise (several hours, not the 90 minutes mentioned in the recipe.) When I make this next time, and there will be a next time, I will probably heat the buttermilk slightly. The dough was easy to work, very dense, made very nice rolls. Will probably try a loaf of bread next time, though. I always make a recipe as directed the first time, then modify from there. Very good, just the right sweetness, too. with the cold buttermilk. I wonder if I had such good luck because I used a very long refrigerated rise? I shaped the rolls into a springform and left them on the bench for a short time, then put them into the refrigerator until time to bake. About an hour before they went into the oven they came out into the very warm kitchen to warm up on the bench. They had gotten to about 90% proofed in the fridge. I might have just escaped the cold milk issue without even suspecting it. Thanks for the heads-up. I'll watch out for that when I don't use the overnight, refrigerated proof. These rolls are sure tasty, aren't they. Oh, by the way. My bread/rolls don't always look like the gorgeous pictures on the fresh loaf. These looked EXACTLY like the picture. That looks awesome! oh dear. I made this bread a few weeks ago and it worked first time around (yeah), as i'm off wheat and dairy, is used white spelt and combined soya cream and lemon juice to create a buttermilky effect, worked quite well. I made another one just now with spelt, buckwheat and ricemilk. Can't wait to try it. The cluster looks beautiful! I used 1% buttermilk when I made it but am happy to hear that milk+lemon juice method works. We don't always have buttermilk in the fridge. If you shop around for it(in a larger city), you should be able to find what you want. I have access to buttermilks made from skim milk, 1 1/2% milk, and whole milk, at least. This is just at the 2 "neighborhood" supermarkets. Yes, but I believe that's not "real" buttermilk, mrfrost - the stuff on the supermarket shelves is made from milk that has bacterial culture added to it - sort of like yoghurt. It would be cool to try actual buttermilk (without resorting to churning our own butter). Thanks for sharing. I made some fromage frais late last week and decided to use this recipe to make some bread with the leftover buttermilk. If anyone is interested, it also makes fantastic dipping toasts/croutons. We had a wee bit leftover that was past its best. I sliced it finely, brushed with olive oil and sprinkled with salt and pepper and re-baked them, which also brought out the taste of the sesame seeds . One of the best things I've tasted in a long time! I just made these tonight. First I measured out 6 cups of flour - then I weighed it. What I found is that my 6 cups weighed over 850g instead of the 750g listed and so I had to remove quite a bit of flour from the bowl. Once I did that, the dough was just right, not too dry with a little over 1 3/4c buttermilk. I also used instant yeast and so did not use any water. I also found that at 425 degrees, the tops of the rolls got very dark very fast and I think in the future I would drop the temp a little. However, the texture was great - very light and fluffy. Lastly, I didn't find them to have a lot of flavor; somewhat bland. Perhaps more honey or some sugar next time? Maybe try shaping it and putting it in the fridge overnight to rise in the fridge to develop the flavour. That's a great idea, ejm, I will try that the next time I make it. I just baked this as a practice round for thanksgiving, where I'm supposed to bring the bread. I saw the picture on the front page and had to try it. Delicious and gorgeous. I wish everything I made came out this way. The only problem for my test drive is that the bottom came out a little hard. I could say that I should cook it a bit less than 30 minutes, but I don't think that it would be cooked enough. I have so little experience with this kind of bread that I don't know what correction to make. I followed instructions above completely, but ended up having to add a bit more water on top of the 2 cups of buttermilk - no more than a quarter cup. Have noticed several comments here about the dough being too tough, overly dense, under-proofed,etc. 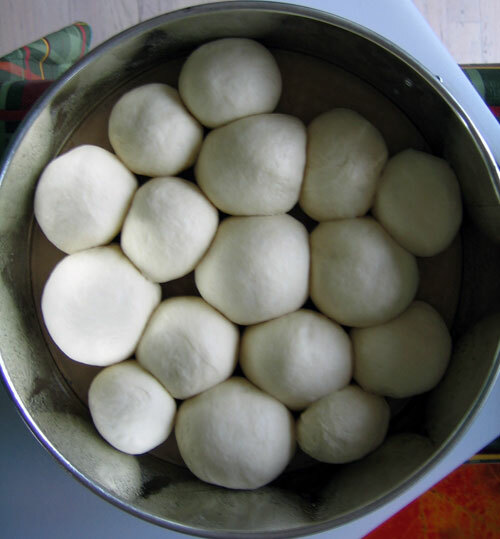 I'm making these rolls for Thanksgiving, and know that I will have to be prepared to adjust the moisture based on the feel of the dough as it comes together in order to get it right. 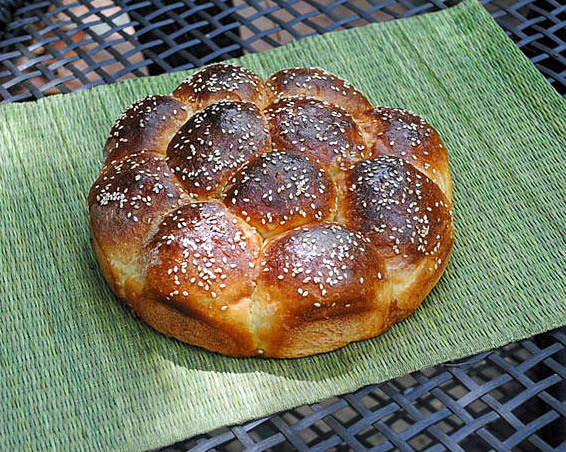 The great and brilliant Danielle Forestier said it best when it comes to bread recipes: "There is no formula for water." In this case, that would cover buttermilk, or in any liquid, whatever recipe you're using. Her lesson -- and I have learned to take it seriously after years of experimenting -- is that the measurement for flour should be treated as an exact requirement while the liquid can adjust up or down within a very broad range. This is why we love bread-baking, yes? I have absolutely no idea how this will come out. I made it in my Viking Stand Mixer as one of my last recipes of the nite. So the verdict will come to you all later this evening! Starting with Floyd's original recipe I stuck to the recommended amount of flour; using a little over 6C. I didn't have bread flour so I used KAF all purpose. I have no idea if this will help with tenderness; but I SIFTED all of the flour before I began. (Gosh it looks like silk once sifted) anyway, no, I didn't re-measure I just went with that amount. I used the SAF Red Instant Yeast... so I didn't moisten the yeast I just added it at the beginning with dry ingredients. And utilizing what I gathered from the comments I changed the liquid amount. I decided to go 2 full cups of buttermilk. (Oh remind me to post on authentic buttermilk in new topic - so much easier than you would imagine if you use a stand mix.) I used store bought buttermilk for this. I also used two Tablespoons of Honey instead of one, hoping to counteract the 'blandness folks wrote about. Now I'm a 'year old' newbie to bread baking and that is intermittent at best. So my thoughts may not be correct, I will definitely post after we, hopefully, devour it...OR after we laugh, about the brick I made ~time will tell. Then I kneaded a tiny bit by hand using the 'folding' technique you use with French bread (hoping to add flavorful character)? I cut into 12 pieces (no weighing, just by eye). I rolled them and placed in a PAM sprayed round cake pan. Ok I was falling asleep, so skipping the next 45 mins rise before cooking I proofed in fridge overnite....covered it with a damp cloth first and went to bed. (actual fridge time 6 hours.) Took it out this morning and was pleasantly surprised at the rising that took place. Prior to this it hardly proofed at all. Now it is sitting on the stovetop with a large bowl over it. I don't want to cook until last minute, so it will sit there until 1pm (yikes) PLEASE DO TELL if this is a mistake. Then I thought I'd cook it while turkey is 'setting'. God Bless, I'll keep you posted and welcome your comments. So? I'm dying to hear. Did it turn out? It sounds like it was going to work (as long as it didn't rise too much before you baked it). I love that you just went ahead and winged it without testing first. That's MUCH more fun! 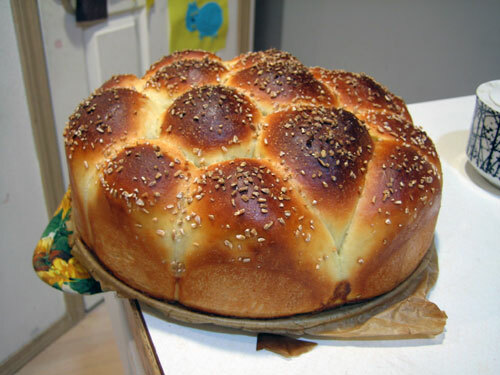 As for when to bake the bread, if it had been me, I would have been inclined to bake the bread in the morning before putting the bird in the oven, cool the bread completely on a wire rack and then just reheat it gently just before dinner. But I can't wait to hear that using your method worked out fabulously. And if you find you didn't love the bread, you can always chop it up, let it air-dry or freeze it and use it to make stuffing for the next holiday feast. So sorry for delay. I can't even write at the moment but hated to keep you waiting..
My only issues came with the proofing, no problem just too long of a wait and I didn't have a high enough pan. (After my initial 45min proof, into the fridge it went for 5 hours, then brought to room temp with it continuing to rise for 8 more hours due to lack of cooking space. LOL! I kept moving it to larger base but low sided pans resulting in a flatter loaf but with all the flavor and 'crumb' that I would have expected from a higher (much more photogenic) loaf. You are right, I could easily have baked it the nite before or earlier in the the day...here we are 2 days after baking, one roll left and I had it toasted with butter and drizzled honey last nite -to die for IMHO, will do so today as well. My 'Country White Bread' doesn't last an hour in the his house. But with all the Thanksgiving food we had and the fact that it had the buttermilk tang (I didn't tell any of my loving bland-palleted family) it lasted longer. I'm determined to expand the palletes of my loved ones!!!!! So much more to write later. Though I would stand by my adjustments made (a lucky guess), and previously written. Obviously I couldn't have made those adjustments of it weren't for the kind folks on this forum that share their experiences as well! Elizabeth re: I love that you just went ahead and winged it without testing first. That's MUCH more fun! You are so right it is more fun, but you have to be willing to expect disasters that are thrown away, as well Such as my first attempt at pastry creme that never thickened this week, my ganache (first attempt) was awesome though. 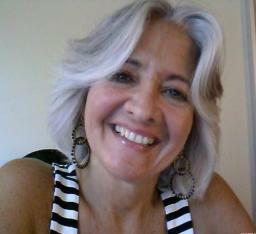 Talk soon, I'll follow your blog and recommend it, it's lovely. I'd appreciate if you do the same for me; though it'll be a few weeks till I'm writing everyday. There's plenty to read now just not all regarding baking. PS I need assistance...directions on inserting photos? New Macbook and I'm not I-photo literate yet! And NO need to apologize for any delay in reply! Sometimes I forget for weeks to come back here. Writing every day? Are we supposed to write every day in our blogs?! For inserting photos here, this Posting Photos FAQ might help? I rarely buy buttermilk as I only need a cup or two of it then the rest goes bad. In the past I've frozen left over buttermilk to use as needed but finally got to the point of why bother. I bought buttermilk solid powder now. For this recipe I substituted condenced milk and added some buttermilk powder. It was awesome. I opened a can of tomato soup and that was my dinner. I've often used plain yoghurt in place of buttermilk. It works just as well. Just beautiful!I'm going to try them soon. 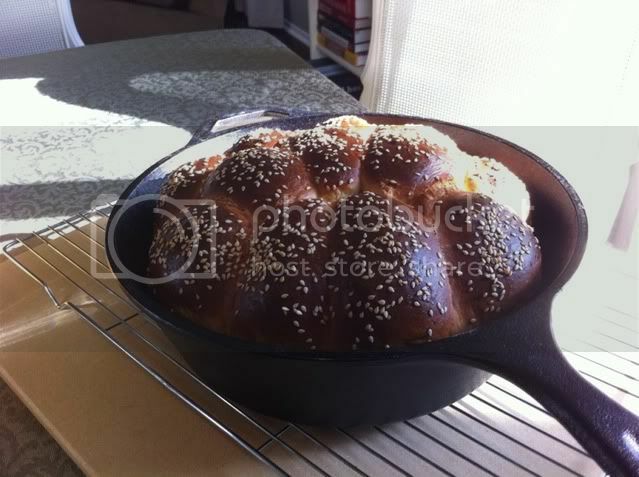 Thanks for sharing the photos and recipe! I bake my first BBQ pork fillings pumpkin milk cluster last night. This plate is the electric pot lid. It's very good looking bread. I like it so much. Thanks for this good idea! 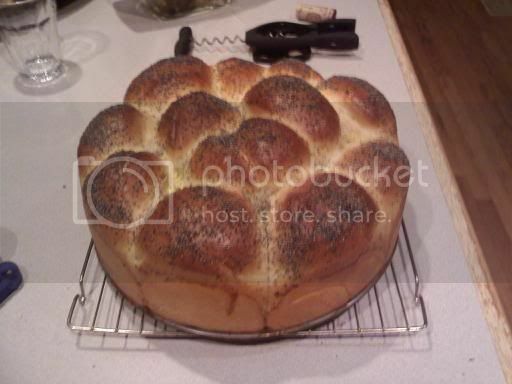 I subbed kefir for buttermilk -- could this be why there is almost no taste to this pretty bread? A few other folks have made similar remarks and it kind of leaves me scratching my head. What are you expecting it to taste like? Isn't plain old buttermilk bread always pretty... plain? This merits of this one is that it makes an eye catching loaf that is great for mopping up cranberries or gravy and it is dead simple to make, but I'd never tout it as one of the more delicious breads on the site. But if you used it as a base and subbed in some whole wheat flour or mixed in some seeds or herbs or grains? I bet you could come up with something more interesting. I'm also thinking that just a teeny bit more salt would do the trick, or heck -- a whole lot of butter! Absolutely, you could enrich it or sweeten it to come up with something a lot more flavourful. Replaced the yeast in this recipe with one cup of sourdough starter and utilized the basic substitution process (added 2/3 of the amount of flour called for, then the liquid). Let it sit overnight; added the rest of the flour, honey, salt, etc; kneaded it into a ball and let it rise for about 6 hours the next day. The crumb was beautiful and shreddable and soft -- a real testament to the sometimes unorthodox sourdough substitution! It was a show stopper at my dinner party the next day. Thanks again. I tried this, starting the process the day before yesterday and leaving the dough to rise in the fridge overnight. I went to bed late and got up early (only about 6 hours sleep - poor me!) and was amused to find the rampant dough making a bid for freedom over all sides of the large bowl it had barely half filled the night before. 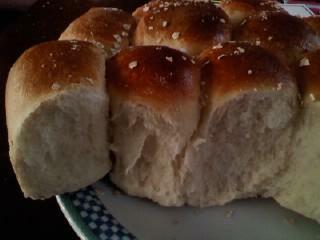 Still, I punched it down, kneeded for a second time and made my small rolls. I found I had to work quickly because they were not keeping their round shape while I was rolling the next, flattening slightly before my eyes. I only have a large flat sheet or two 8" loaf tins to chooses from, so I made two loaves out of a collection of small rolls, hoping to still get that lovely look on top. Using a sharp knife to slice of pieces I was delighted to see large irregular bubbles forming, and I tried to handle as little as possible. The first tin I used what I felt was just enough dough, then used the remainder in the second tin, which turned out to be a little over half. I skipped the egg wash... I'm sure I'm being silly but I always feel it's a waste of an egg. I usually use water, butter or a little olive oil... this time I went for the olive oil. Then I had to go to work, so I popped them back in the fridge and left the house for another 6 hours before heading back to work from home. I found that the first loaf had risen nicely to fill the loaf tin, and the second (of course) had begun to ooze over the sides. I baked them anyway, allowing them to come to room temperature first. I didn't get much spring, if any at all. I'm yet to discover where I'm going wrong with this as I don't think I've ever achieved it. Perhaps it's my oven. More likely it's my method. The bread had a lovely flavour and texture, though it was a little denser than I had hoped. The crusts were great all round, and of course the monster second loaf was gripping the edge of it's tin with it's bulging crust. Slicing this one I find I have a brilliant mushroom shaped slice! So, I still have the same old problems I always have; sticky dough (whatever recipe I follow I find the dough incredibly sticky to work with, and end up adding an enormous amount of flour during the kneeding process) and little or no spring. Are these related perhaps? If I can find a way to work with my dough without adding so much flour perhaps my bread will be lighter? Finally, my fussy eating boyfriend loves this bread more than my last. Result. Thanks Floyd! Good idea to use the cast-iron pan! Not too shabby at all. Good idea to use the cast-iron pan! Floyd, I had looked at these rolls with yearning for so long that I knew this year I was going to make them for Thanksgiving. I didn't read all the comments until I had already made my discovery that the dough was too dry. Thank you, LyndonDimont for the weight recipe! Luckily, I am a very experienced baker, because here in DRY New Mexico, I knew to add a good deal more than an extra cup of buttermilk to 4 cups bread flour with 2 WW. The dough looks right now after kneading, which is smooth and soft. Thank you, Floyd, for posting the recipe, and thanks to all who joined in about their experiences! Obviously I was not the only one to make these! These worked wonderfully for my contribution to the table on Thanksgiving. I doubled the recipe and it worked out terrifically. I would have taken pictures but I was too slow. Tasty and really easy to get together. I loved working with this dough. Thanks and I hope your Thanksgiving was as good as mine. This looks awesome! I gotta try this one...Can I substitute regular milk for Buttermilk? Will it make a difference? Just made this bad boy. We're having it for dinner with some fried chicken. I have 2 toddlers so it's impossible to knead bread with them around. I threw all the ingredients into the breadmaker. And I had to use buttermilk substitute since it would've only been used for this bread. I had to add about 7tbsp of water while the machine was mixing the ingredients because of how dry the mix was. It came out beautifully and I baked it for about 25mins. It sprung back but also it was turning too dark. Had it for dinner and the kids inhaled it. It was great tasting but rather dense. We didn't have it warm since I had to make it around the morning and it was done by noon but maybe that affected the texture? What else could be done to make it less dense are very VERY light & fluffy. Either way, I wanted it warm so I zapped a bun pull for 10-15 secs. and it was a big less hard and warm. Thanks for the recipe! Please excuse the lateness of the reply. My guess is that your bread dough needed more liquid. Or less flour. I'm not at all familiar with mixing dough in a bread machine (I make all our bread by hand) but I see from my notes about when I first made the buttermilk cluster using this recipe, I had to add a lot more water and buttermilk. SAVEUR magazine's kitchen featured this recipe in their magazine and they called for 5 cups of flour rather than the 6 – 6½ cups in the recipe here. I used the full amount of flour and added about 1/2 cup more liquid to get lovely fluffy bread. Had 1 cup of buttermilk to use up so halved this recipe. The dough was a heavy mass and having no more buttermilk to add in I added a 1/4 cup of sourdough starter. The rise was beautiful and the response was they were excellent. The question I have is was it o.k. to add the starter? Should I have substituted something else? Especially considering the feedback you received. Just about any other water-based liquid could also have been used, whether milk or cream or almond/soy/rice milks or water or whey or ... Every one of those will have slightly different effects on the dough and the finished rolls but any of them would serve to add some more moisture to the dough when required. What none of them can do is add more leavening, which you got with the starter. I was concerned I'd added to much leavening. I had the sourdough starter out to make some pizza dough so it was just handy to add. Again thank you for your response. I think I'll make the starter a permanent addition. I made this recipe for Thanksgiving dinner and just changed one thing - added 2 TBSP of butter. They were light and fluffy and delicious! Sorry I don't have pics but we ate them all! 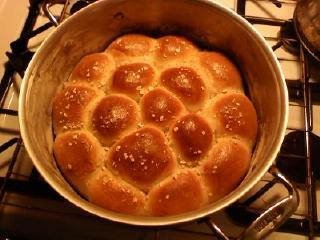 I placed the rolls in a 9 x 13 pan and made 15 rolls (3 across 5 down the sides of a buttered glass pan. Since I was using a glass baking dish I reduced the baking temperature by 25F and they were done exactly at the 30 minute mark. Excellent rolls that reminded my friend, Carol, of the ones her mom used to make. Thanks for the recipe.